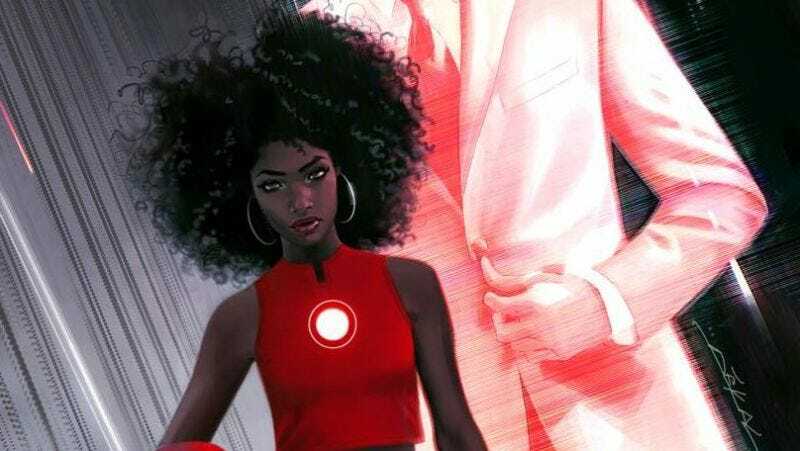 Riri Williams has been making headlines before she even readied the mantle as the replacement Iron Man. Now, she’s got the go-ahead from the man himself, in the first comic meeting of the two heroes. The genius M.I.T. student debuted this spring in the sixth issue of“Invincible Iron Man,” as part of Marvel’s Marvel NOW! initiative. After building her suit from scratch and taking it for a successful mission to stop inmates from escaping a New Mexico prison, the 15-year-old girl got a visit from Tony Stark in this week’s issue of the series, as shown by Comic Book Resources. In the issue, Stark shows up to inspect Williams, who he was surprised to learn was able to reverse engineer one of his multi-million dollar suits. Riri and her mother are in the middle of an argument because her mom is concerned for her safety, but Tony knows what’s what. He recognizes that Williams, like him, is someone who won’t stop once she’s put her mind to something. Afterward, he takes them out for “Der Wienerschnitzel,” because it’s Chicago and that’s what people do. What, no Chicago dogs? We still don’t know what will happen to make Tony give up the mantle, but he seems pretty impressed with his impending replacement.